Top Teams carry tremendous collective intelligence, operating experience, and the ability to exert significant influence over their company’s mindset, focus, and performance. They have both the opportunity and obligation to navigate big change and make a significant difference in the future of their organization. Ultimately, they are responsible for dealing with both the “Now and the New” — the current reality and the evolving future. While all executive teams have this responsibility, only some do it well. Even fewer do it well when under tremendous stress and pressure. The nature of the game for Leadership Teams has changed. But have they? Classic high-performing teams were not designed for the world of today and tomorrow. The question of how to move good teams to the next level – to that of Top Teams — is one of both competitive advantage and survival in a more interconnected and complex world. Top Teams must continually re-examine how they work together, constantly re-defining themselves as a team that deals with the current and evolving world, staying future-focused while executing the “real work” of today. 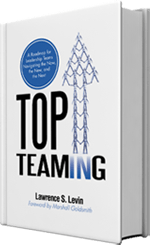 Top Teaming: A Roadmap for Leadership Teams Navigating the Now, the New, and the Next™ provides a roadmap to help your Leadership Teams and executives at all levels successfully navigate the new normal environment of increasing complexity, volatility, and change. It is focused on making your groups of smart leaders into those super-performing teams that drive growth, success, and innovation in your business. Levin typically works with smart and successful people across a range of industries. He also specializes in accelerating significant change within complicated systems, such as businesses which have seen rapid growth, major technology changes or mergers and acquisitions which have created complex corporate cultural clash issues. His 25 years of consulting experience, coupled with his background in psychology, makes Levin a sought after executive coach and trusted advisor. © Copyright 2013 - 2019 Top Teaming. All rights reserved.